These Free backing papers are for your cardmaking and scrap booking projects. They are yours to use as you wish ... but you must hand make something with them. I like to keep you informed of the free stuff that is there for your use, and these collections are no exception. They are my attempts at designing backing papers. And although they may lack the sophistication of some of the other designers, they are yours to use on your projects... if you wish to. Please don't print them off and give or sell them as your own, and please don't print them off for others to use. Just point them to the website and then they can get the papers for themselves. 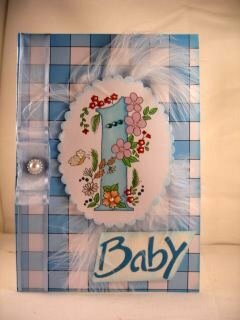 The cards on this page are some that I have designed and they are all made from these collections, and I will add more as I learn. The booklets are in a PDF format and are easy to download ... but they will take a little time to download so please be patient. You can then print off as you need them and I hope you will show me some of the cards that you make from these papers. Just add them to the Gallery Page for us all to see and tell us a little about you... the card... and the papers you have used. 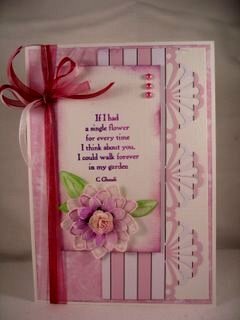 Here are some of the cards I have made using the Add A Little Stripe To Your Life collection. This set of papers were sent out a while ago in a Free Newsletter. The Newsletter is sent out each month, and if you would like to receive your copy and regular updates please sign up to the subscription .....it's FREE too !! The stripes can be mixed and matched with other colours, as well as the patterns in this Pink Collection. The characters are from different sources, some stamped, some downloads, and many of them are free. This link will take you to the Freebies. You will find some really useful text papers that can add a sentiment to your creations, and I would love to see what you do with the free backing papers.